It's been quite some time since my last post, and a whole lot has changed. I went from living on a couch in Battery Park City to a air mattress, then futon in Harlem, and now have a crib in the East Village. Unemployed to intern to full time employee. Cheering for Durant at the NBA Draft to Felix in the Bronx to the Seahawks in Green Bay. Added a few Facebook interests (cheese, Kenny Mayne hosting SportsCenter), found a few new bars to frequent (Lucy's, Mudville 9), got hooked on a few TV shows (The Wire, Lost). I missed over half of 2007 here in Cyberspace. I guess that's what happens when you get a job. NBA Draft, Madison Square Garden: Sporting my Chris Wilcox t-shirt, I was in the front row of the back section of the MSG WaMu Theater, and was officially the first Seattle Supersonics fan in the world to shake the hands of Kevin Durant and Jeff Green. I also gave props to fellow Washingtonians Spencer Hawes and Rodney Stuckey. Been there, done that, bought the t-shirt. Yankees/Angels, Yankee Stadium: When a few of my buddies from Boston came to town and we had extra tickets to a Yankees game, naturally we all put on Red Sox gear and made a trek out to the Bronx. One of us had a few too many beverages beforehand and nearly instigated a riot, as the entire stadium booed us and tried to get us kicked out. It was arguably worse than it would have been had the Yankees actually been playing the Sox. Remind me not to do that again. I'm not even a Sox fan. Yankees/Devil Rays, Yankee Stadium: On a nice Friday night in July, I got to see the Yankees get crushed by Tampa 14-4. I thoroughly enjoyed every minute of it. US Open, Queens: Roger Federer defeating Feliciano Lopez, 3-6, 6-4, 6-1, 6-4. We got hooked up with incredible seats. What a day of sports. 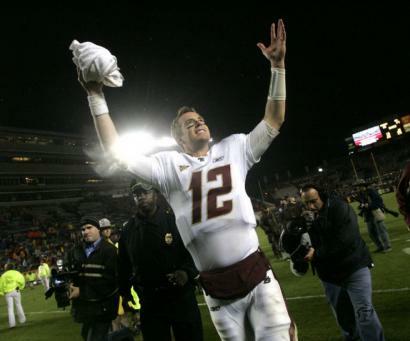 BC/FSU, Chestnut Hill, MA: The beginning of the end for BC Football, this is when the wheels came off. I should have learned my lesson and not attended any other games. BC/Maryland, College Park, MD: If the wheels came off against FSU, the whole thing caught fire and burned to the ground at Maryland. Not even my Jesus piece could help us. Sonics/Knicks, Manhattan: Kevin Durant's first trip to the Mecca, and boy did he impress. Led the Sonics to a 117-110 victory with 30 points, including key buckets down the stretch and a thunderous jam right on David Lee. I loved it. Spike Lee would disagree. Blazers/76ers, Philly: After meeting Greg Oden and spending a day with reporters demoing College Hoops 2K8 (I love my job), we posted up 7 rows back on the baseline for the Blazers/Sixers game. I was excited to see my boy Brandon Roy play, and by halftime the game was an embarrassment: 45-27, advantage Portland. But the Sixers came out hot in the 3rd quarter and eventually completed the improbable comeback, winning the game by 4 points. It was the first time I had ever seen Louis Williams play. I added him to my fantasy team the next day. The kid is going to be good. Mavericks/Jazz, Salt Lake City: After I missed my connection in SLC back to NYC from Sun Valley, I rang up my one friend from Mormon Country and he had a spare ticket to the game. I have honestly never seen an NBA crowd quite like Utah--every single person was engaged, the place got LOUD, and everyone stayed until the finish. 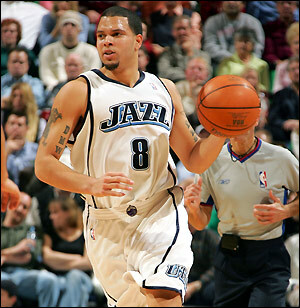 Deron Williams is going to go down in history as a great point guard. Mark my words. 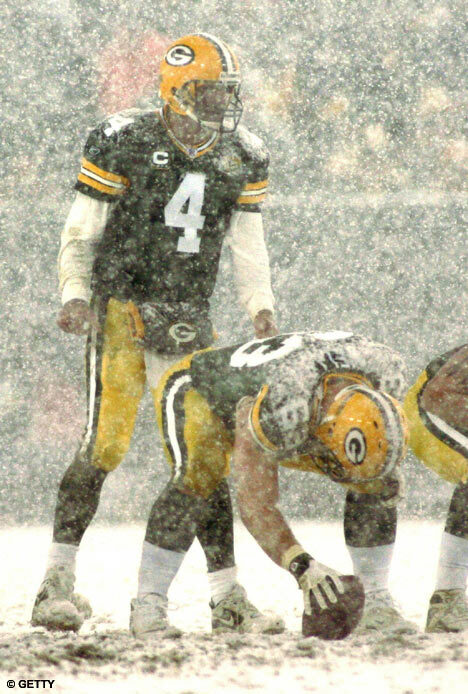 Seahawks/Packers, Frozen Tundra, Wisconsin: This trip truly deserves its own post, but I'm not sure that'll happen or not. The abbreviated story: 14.5 hour drive from NYC to God's Country, freezing weather, snowflakes as big as softballs, lots and lots of cheese, and the best experience you could ever have while watching your favorite team lose a playoff game on the road. Simply amazing. Until that 14.5 hour drive home. Clippers/Knicks, Manhattan: Typical Knicks game, they stayed in it for nearly 4 quarters before letting the game slip away with 3 minutes left. It was great seeing David Lee dunk on Chris Kaman, exclaiming "That was out of this world!" after a Sam Cassell drive, and discussing how he was an "All-Universe" guard, representing Mars. The main staple of The Roundup has been sports, especially attending games live. Doing so is one of the things in life that I truly value. Sure, I grew up watching Michael Jordan on NBA on NBC, but I'll never be able to tell my kids that I saw him in person. But over the last 7or 8 months, I've added some good new ones to my list. 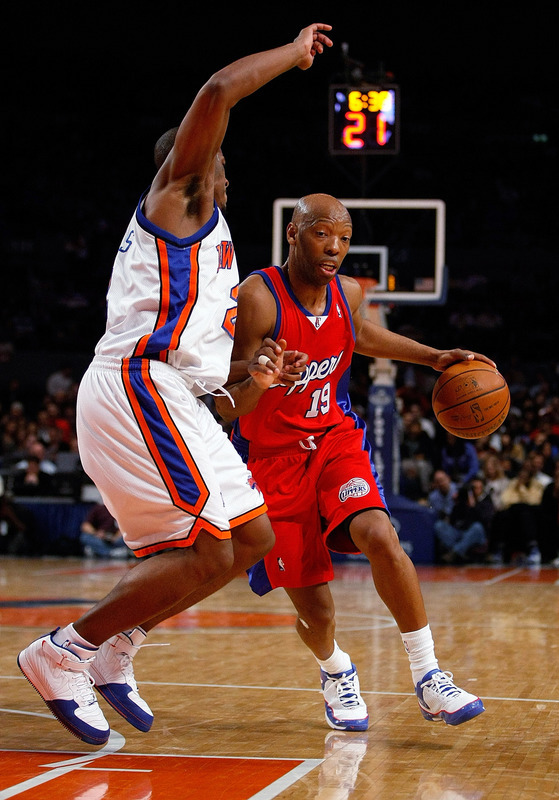 Crawford, Felix, Federer, Ryan, Durant, Green, Roy, Igoudala, Louis, Dirk, Deron, Favre... and of course, the only extra terrestrial playing professional sports, Sam Cassell. I probably will not post as much here as I am now writing for Buckets Magazine. I will still write about the Mariners and Seahawks on occasion, but all basketball writing will appear on the Buckets website. Check out the site, and thanks for reading. A year ago, the Portland Trailblazers were in position to get the top pick in the 2006 NBA Draft, but the lottery didn’t favor them. A year later, luck came back to them in the form (potentially) of a 7-foot franchise center named Greg Oden. A few hours north on I-5, the Seattle Supersonics were also counting their blessings, beating the odds and obtaining the second overall pick that will likely translate into Kevin Durant. In two other cities, Memphis and Boston, who were poised to take the top two picks, morale is low and GM’s are heated. But with all the talk about the Blazers and Sonics sneaking in to grab the top two picks, people have overlooked how lucky the Atlanta Hawks were. The only way the Hawks were going to keep their top pick was if it was in the top-3, when they were likely to land just outside at 4 (otherwise it would go to Phoenix due to the Joe Johnson deal). They also obtained the top pick of the Pacers because of the Al Harrington trade, but only if it was outside of the top-10. The pick landed at 11. Already with a core nucleus of young, exciting players, Atlanta is poised to make a serious run in the East and have a legitimate shot at rebuilding their team. 1. Portland Trailblazers - Greg Oden, C, Ohio State - Although they may be gun shy passing up an explosive swingman for a center (Sam Bowie vs. Michael Jordan, anyone? ), Greg Oden is the real deal. They should immediately contend in the West with a nucleus of Rookie-of-the-Year Brandon Roy and fellow 2006 lottery pick LaMarcus Aldridge. 2. Seattle Supersonics - Kevin Durant, SF, Texas - The Sonics have said they are going to re-sign Rashard Lewis, who plays the same position as Durant. This will be a very exciting team to watch next year, and should institute a game plan similar to the Golden State Warriors this season. A lineup of Luke Ridnour, Ray Allen, Rashard Lewis, Kevin Durant, and Chris Wilcox would be tough to keep up with. 3. Atlanta Hawks - Mike Conley, Jr., PG, Ohio State - The Hawks most glaring need is at the point, and Conley is going to be great. A no-brainer. 4. Memphis Grizzlies - Al Horford, PF, Florida - Horford would be able to step in and help right away, and could contend for Rookie of the Year honors. A frontcourt of Pau Gasol, Horford, and Rudy Gay is a great way to move forward. 5. Boston Celtics - Yi Jianlian, PF, China - Bill Simmons called this the “worst case scenario” for the Celtics. It’s bad news in Boston, although Yi could shut everyone up if he lives up to his potential. 6. Milwaukee Bucks - Brandan Wright, PF, North Carolina - If the Grizzlies and Celtics pass him up, Milwaukee would be stupid not to select this explosive power forward. 7. Minnesota Timberwolves - Corey Brewer, SF, Florida - Brewer fits the bill as an explosive scorer and defensive stopper, exactly what Minnesota needs to add to their roster. He would compliment Kevin Garnett, Randy Foye, Rashad McCants, and Craig Smith extremely well, giving the Timberwolves a strong nucleus to win now as well as build for the future. 8. Charlotte Bobcats - Joakim Noah, PF, Florida - His stock dropped this season, but should still stick in the lottery. He would help the Bobcats in the frontcourt on both ends, as well as provide intangibles such as leadership and work ethic. 9. Chicago Bulls - Spencer Hawes, C, Washington - The Bulls most glaring need is low-post scoring, and Hawes may be the best low-post scorer in the draft. 10. Sacramento Kings - Julian Wright, SF, Kansas - This draft is stacked at the small forward position, and Wright is one of the best. Wright would fit in well in Sacramento as they are likely to try to move Ron Artest this offseason. 11. Atlanta Hawks - Al Thornton, PF, Florida State - Atlanta, like the draft, is stacked at the small forward position. Thornton would give them some needed help in the frontcourt, as their selection of Sheldon Williams last year continues to haunt them. 12. Philadelphia 76ers - Jeff Green, SF, Georgetown - If Green stays in the draft (70% chance he returns to school, he claims), Philly would be ecstatic if he dropped this far. I personally think that if Green is taken anywhere outside of the top-5, he is a steal. He plays both ends of the floor, his body is NBA-ready, he has range on his shot, and he is a proven winner and leader who can take the big shot. 13. New Orleans Hornets - Thaddeus Young, SF, Georgia Tech - With Desmond Mason likely out in New Orleans, the Hornets will look to reload with the best SF still on the board. 14. Los Angeles Clippers - Acie Law IV, PG, Texas A&M - With Shaun Livingston’s career up in the air after his gruesome injury, the Clippers will look to shore up the position. 15. Detroit Pistons - Sean Williams, PF/C, Boston College - The Pistons need to address the defense in the low post that they lost when Ben Wallace took off for Chicago. Williams, a projected lottery pick before his off-court issues, would be a great fit, but a bit of a stretch. 16. Washington Wizards - Jason Smith, C, Colorado - Even without Brendan Haywood requesting a trade, Washington needed to address the center position. Smith is a talented, athletic big man who would work well with the uptempo style of Gilbert Arenas, Caron Butler, and Antawn Jameson. 17. 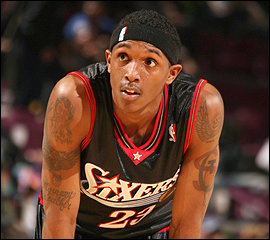 New Jersey Nets - Nick Young, SG, USC - Young has a smooth stroke and can rock the rim… sounds like Vince Carter, right? He isn’t quite on that level, but drafting Young will allow the Nets to not worry so much if Carter is gone next year. 18. Golden State Warriors - Tiago Splitter, PF, Brazil - The Warriors don’t have much need except in the front court, and Splitter can run with the guards. 19. Los Angeles Lakers - Rodney Stuckey, PG/SG, Eastern Washington - The Lakers need to give Kobe another scorer, and Stuckey is as explosive as they come. Under the radar at Eastern Washington, he could really turn some heads in the spotlight of the NBA. 20. Miami Heat - Javaris Crittenton, PG, Georgia Tech - Miami needs to address the point, with Payton aging and Williams slowing down each year due to injury. 21. Philadelphia 76ers - Josh McRoberts, PF, Duke - I am not sold on McRoberts as an NBA player, but it may be because he played out of position at Duke. Billy King fits the bill as a GM who could make the mistake of drafting him. 22. Charlotte Bobcats - Daequan Cook, SG, Ohio State - Cook will be the third Buckeye taken in the first round this year, and would give the Bobcats a serious upgrade over Matt Carroll. 23. New York Knicks - Glen Davis, PF, LSU - With the 23rd pick, unless a lottery pick drops to the Knicks, I don’t see Isaiah Thomas doing anything but getting booed. 24. Phoenix Suns - Marco Belinelli, SG, Italy - He can shoot and play some defense, and would be a good pick in case the Suns lose anyone from their core backcourt in the next couple years. 25. Utah Jazz - Derrick Byars, SF, Vanderbilt - The Jazz could use to add another outside shooter. Byars stock soared after a strong senior season and stronger NCAA tournament. 26. Houston Rockets - Brandon Rush, SG, Kansas - If Rush slips this far, it would be a perfect fit for the Rockets, adding a scorer in the backcourt to play alongside Tracey McGrady. 27. Detroit Pistons - Marcus Williams, SF, Arizona - He can play the 2 and the 3, and would be a huge upgrade over Flip Murry in the “scorer off the bench” category. 28. San Antonio Spurs - Rudy Fernandez, SG, Spain - It is no secret the Spurs like foreign players. Fernandez could be another good one. 29. Phoenix Suns - Ante Tomic, C, Croatia - Everyone is searching for the next quality foreign big man. Tomic could be it. 30. Philadelphia 76ers - Gabe Pruitt, PG, USC - With 3 picks in the first round, I would be surprised if they keep them all. If they do, Pruitt would be a strong pick, as they need a young point guard. I don’t see Andre Miller on their roster next season. Just as I did with Madison Square Garden, I made a point to get to Yankee Stadium this season because I live in New York. A weekend series against my Seattle Mariners was a perfect excuse. After the game Friday night (a 15-11 Seattle win that I did not attend) I was thinking there could be 100 runs scored in the 4-game series, with the problems the Yankees had been having with their rotation and the Mariners lack of good pitching in general with Felix Hernandez on the DL. Boy was I wrong. Saturday started off with a nice little reunion on the roof of a parking garage with a few of my friends, as we enjoyed some beers and sunrays. With Jeff Weaver pitching for Seattle, I made a couple bets that the Yankees would hit a first inning home run. Keep in mind, Weaver was entering the game 0-4 with an ERA over 18. We found our seats and settled in with an $8 beer to enjoy America’s pastime. Surprisingly, Jeff Weaver didn’t get shelled in the first inning as I had expected. Or the second. Or the third. In fact, it took until the sixth inning for Weaver to let the game get away. You know it’s bad when you go five and two thirds of an inning and give up six runs, and your ERA actually goes down. On the other side of the ball, it was a completely different game. Chien-Ming Wang had been perfect. No hits, no walks, even aided by a couple great defensive plays by A-Rod. At this point, I became a very annoying person to all the Yankee fans in our section, continually asking out loud, “Is it bad that I’m talking about this being a perfect game? Am I going to jinx it?” Sure enough, in the eighth inning the Mariners finally got to Wang as Ben Broussard pulled a misplaced changeup over the fences in right. Perfect game, huh? Almost made it. I returned to the Bronx on Sunday, two glorious days in a row to watch a baseball game. It wasn’t quite like watching a perfect game unfold, but it was fun nonetheless. In the fifth, as Yankees first baseman Josh Phelps scored New York’s first run, he went out of his way to railroad Mariners catcher Kenji Johjima, even though Kenji had left home plate wide open for him to slide through because he knew the throw from Ichiro would be late. The following inning, as Phelps came to the plate, Jarrod Washburn plunked him in the back in retaliation. Because it was Yankee Stadium and not Safeco Field, the fans didn’t even realize that Phelps had made a dirty play and this retaliation was inevitable. So when Scott Proctor threw at Yuniesky Betancourt’s head in the seventh inning and got tossed, the benches cleared and the crowd came to life. Comments like “David Justice wouldn’t have let this happen” and “Where’s Paul O’Neill when you need him” poured on much to my amusement. Unfortunately for us, no brawl ensued, but it sure would’ve been fun to watch A-Rod get pummeled by Richie Sexson and Ichiro have a kung-fu battle with Kei Igawa. Even though I saw the Mariners gather only six hits and one run in the two games I attended, my trips to Yankee Stadium were great. I saw a nearly perfect game, a near brawl, and Roger Clemens announce that he is returning to the Yankees. It truly is a wonderful ballpark, and it’s a shame it is being torn down. I’m sure the new stadium will be great, and I hear they are keeping all the same dimensions, but there’s something about the history of a ballpark that I love, like at Fenway Park, that I never had in Seattle. The Kingdome wasn’t a historical ballpark, and as beautiful as Safeco Field is, it doesn’t have that same feeling as Fenway Park and Yankee Stadium. So I’m glad that I got to see some baseball in one of the game’s historical playgrounds before it is gone forever. 1. Ken Griffey, Jr. – “Junior” as he was called burst onto the scene and took the Mariners from cellar-dweller to one of the most exciting teams in Major League Baseball. The "Refuse to Lose" 1995 season was one of the best summers of my life, going to games and listening on the radio as Griffey ironically had his first injury plagued and worst year of his young career. But he came up big in the playoffs, hitting .391 with 5 home runs against the Yankees. 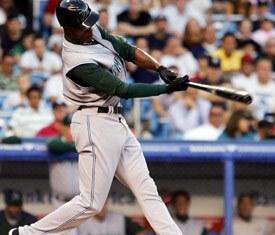 One of the great sports images in my mind is his picture-perfect swing. But the memory that will always stick with me of Junior was the image of him under a pile of teammates after scoring from first base on an Edgar Martinez double to win the ALDS. I’ve never seen someone run as fast around the bases in my life. It was the most amazing sporting event I have ever attended. 2. Marquis Tuiasosopo – The Washington Huskies option-quarterback from 1997-2000, he was one of the most exciting players I have ever watched. His freshman year he was forced into a game against eventual national-champion Nebraska due to an injury to the starting quarterback and threw for 270 yards and 2 TD, and that season became the first ever true freshman to start a game at quarterback for the Huskies. His career highlight came his junior year, where he became the only player in NCAA history to pass for over 300 and run for over 200 yards in a game, a 35-30 victory over Stanford. I remember watching that game, and I have never seen a performance like it. It was even more impressive than Vince Young’s Rose Bowl. No joke. 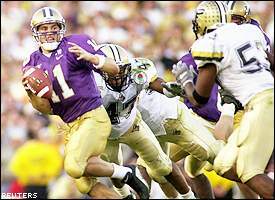 In his senior season in 2000, Tuiasosopo led the Huskies to the Pac-10 title, an 11-1 record, and victory over Purdue and MVP in the Rose Bowl. 3. Shawn Kemp – The Reign Man, as Calabro called him, was a force to be reckoned with. He teamed with Payton to be one of the great guard/forward dynamic duos of all time. Like Payton, Kemp left Seattle on bad terms and ended his career even worse, but while he was in the Emerald City, he was king. I think only Ken Griffey, Jr. surpasses the excitement that Kemp brought to the Seattle sports scene. Like Griffey’s swing, Kemp’s dunks captivated an entire city during his reign. 4. Kevin Calabro – An amazing play-by-play announcer, with catch phrases such as “and Shawn Kemp takes it down THE BOULEVARD!” and “million dollar move, five cent finish.” His talents on air led to his simulcast of games on both TV and radio. Not many broadcasters can cater to both mediums at the same time. 5. Edgar Martinez – “Eeeeeeeeeeeeeeeeeeeeeeeeeeeeeeeeeeeedgarrrrrrrrrrrrrrrrrrrrr!” I’m not sure who started it, but some crazy fan decided he would yell Edgar’s name for as long as he could when he came up to bat. It caught on and every time he came to the plate, fast scattered throughout the Kingdome (and later, Safeco Field) would compete and try to have the longest yell. I remember one time I almost passed out from trying to yell so loud. I also remember Edgar Martinez hitting the double that drove in Joey Cora and Ken Griffey, Jr. to beat the Yankees in game 5 of the 1995 ALDS. Edgar was a clutch performer and a class act, as well as a pleasure to watch play. 6. Randy Johnson – The mullet, the slider, the fastball, and the intensity all took a major part in my love for Randy Johnson. A few Randy moments stick out in my mind above the others… the 500ft bomb he gave up to Mark McGwire while he was on Oakland, when he came out of the bullpen to face the Yankees in the 10th inning of Game 5 of the 1995 ALDS, and even his first game back in Seattle at the newly opened Safeco Field in 1999, when he shut us out and struck out 10 in a complete game, and received a standing ovation after each inning. 7. Dave Niehaus – The voice of the Seattle Mariners, I would listen to him every night until we got satellite TV (cable couldn’t run out to our house). I could never ask for more than the Mariners loading the bases, because if someone hit one out of the park it was time to “GET OUT THE RYE BREAD AND THE MUSTARD, GRANDMA! IT’S GRAND SALAMI TIME!" 8. 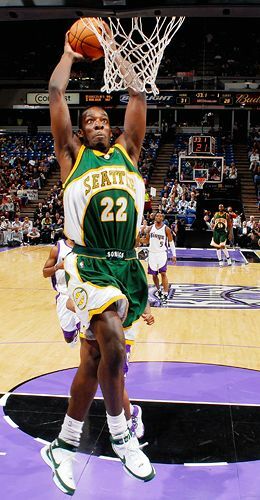 Gary Payton – The Glove burst onto the Seattle scene from Oregon State and quickly made a name and reputation for himself throughout the league as a trash talker and defensive stopper. He ran the Sonics of the 90s, who will probably go down as one of my favorite bunch of balers of all time. He left Seattle on poor terms, but while he was there, it was nothing but love for GP. 9. Jay Buhner – “The Bone” was famous for his bald head, high strikeout rate, power at the plate, “the catch” in Boston where he went over the wall in right, his rocket arm, and my favorite, Buhner Buzz Cut Night. One year as a promotion, the Mariners gave free tickets to anyone willing to have their head shaved. Each year, Buhner Buzz Night became more and more popular, even attracting women to participate. Every team needs a character and a tough guy. Buhner was both, and I loved him for it. 10. Cortez Kennedy – It is kind of sad that there is only one Seattle Seahawk on the list, and that he ranks tenth, but they were a straight AWFUL team throughout my childhood. Not to say I didn’t root for them and follow them, but there just were not a whole lot of players to become attached to. Shawn Springs was the only other guy who came close to making the list. Besides, the 1990s were a great decade for the Mariners and Sonics. Regardless, Cortez was a pleasure to watch, and was good enough to win NFL Defensive Player of the Year in 1992 on a team that won only two games. I am an amateur Skee-Ball player. In my spare time, I have a full-time job working in public relations. I am currently "living the dream" in NYC.